The first part of this series covered the challenges of meeting IEC 61439 standards when building an electrical switchboard. The second and third posts provided tips on everything from component delivery to labeling and marking. With regard to factory quality inspection, the standard calls for carrying out routine verification designed to detect defects in materials and manufacturing. Verification also ensures that the final assembly is working properly. While done on each assembly, panel builders do have leeway as to when this routine verification is carried out. It can be during and/or after manufacturing. Line inspection during manufacturing allows those areas that will be hidden in the final product to be checked. It also can improve manufacturing and inspection efficiency. However, only with inspection after manufacturing is complete will packing be authorized. 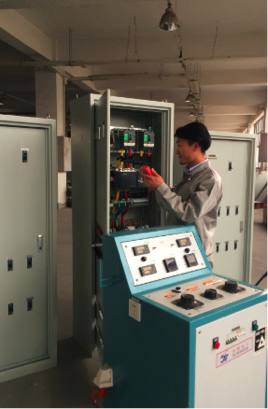 The inspection determines product quality by looking at factors arising from the switchgear’s construction and performance. The first category covers such things as degree of protection against electric shock, mechanical operation, and other items set by the construction of the switchgear. You can find this spelled out in sections 11.2 to 11.8 of the standard. The second category involves items related to the ability of the enclosure and switchboard to do what they were intended to do, with an example being wiring performance and function. The applicable sections in the standard are 11.9 and 11.10. It is best to carry out verifications about construction and performance during the manufacturing process. Such self-checks should cover everything from acceptance of components to final assembly. This approach increases accountability and improves traceability. The final quality inspection should be in a secured and dedicated area, ensuring there will be no risks to people near the switchboard when it is energized. Also, the inspection must be done by qualified and authorized personnel. After the inspection is complete, issue a declaration of conformity, the CE mark, if appropriate. At this point, the job of the panel builder is almost – but not quite – complete. Packing and shipping, the second and third items on the list above, to the destination must still be done. In general, the best approach is to pack and ship switchboards column by column. That eliminates the possibility of assembly deformation during transport or handling. An alternative is to pack and ship two columns at a time, if customer approval is secured beforehand. Packing can be in cases or crates, with a degree of protection that depends on the environment, storage duration, and means of transport. At a minimum, columns are protected by a polyethylene cover. This approach is acceptable if the storage duration is less than three months and if the environment is not too severe. The applicable standard here is SEI3b, which is maintained by France’s S.E.I.L.A. Maritime transport or longer storage periods is covered by SEI4c, with columns protected by a heat-welded vacuum cover filled with bagged desiccants. In all cases, the packing must secure the switchboard columns against mechanical shock. Make sure that all necessary documentation is inside the packing. Also, don’t seal everything up before the packing inspection. As for transportation, remember that switchboards are designed to work in a vertical position. Therefore, make sure that you move and handle them upright, if at all possible. Finally, as part of the service they provide, panel builders may have to perform on-site installation or commissioning operations of the switchboard. This fourth and final item on the list may include receiving and acceptance of equipment on site as well as installation of switchboards and joint blocks. It is best to have these operations and responsibilities spelled out in as much detail as necessary in quotations and contracts. This should cover, for example, what inspections and tests must be conducted on site and which can be done earlier. After this final step is complete, so too is the project. It’s then on to the next one. For more guidelines and information on all aspects of the panel building process, please visit our panel builder’s information page. Great post with lots of reminders. Thanks for doing this series.